When you call a function with parameters and pass an argument to it, Go by default pass the argument by copying it (i.e. pass by value). If you want to pass by reference use pointers. Messi just scored his 102th goal. Now Messi has a total of 101 goals. The intention of the above code is to show that Messi has just scored one more goal so total number of goals scored by him should become 101+1 i.e. 102. 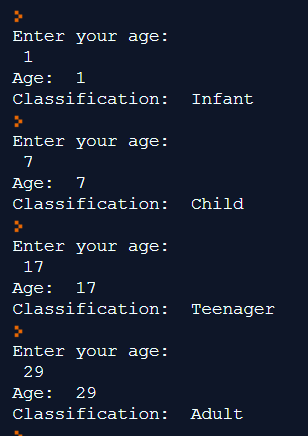 The second statement of the above code is wrong as it is still showing the old value (i.e. 101) in case of total number of goals scored! This has happened because we've changed the copy and not the original value! Now Messi has a total of 102 goals. What's the Difference Between RefCode# 1 & RefCode# 2? The two code samples are same except the following 2 lines. Have a look and try to assimilate how pointer is used. What are the Benefits of Pointers? 1. In contrast to the value type receiver, a pointer receiver is extremely lightweight (4 or 8 bytes) as only the pointer (a reference i.e. an address and not the actual value) is copied and not the entire value. 2. you must use a pointer in cases where the argument value needs to be modified (like in the above example). A variadic function is one that can accept zero or more arguments for its last (or only) parameter. Such functions are indicated by placing an ellipsis (...) immediately before the type of the last or only parameter. --Source: Programming in Go by Mark Summerfield. Example: fmt.Println() is a variadic. An example is better than any explanation. See the following code sample and its output. 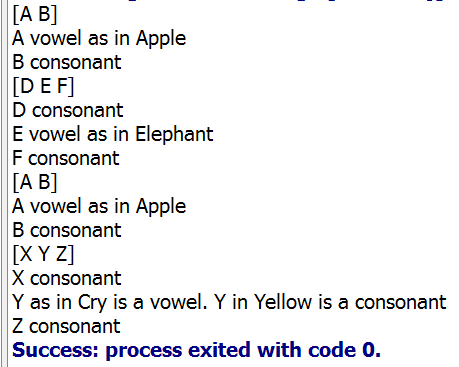 In the code we've a function named classify that takes variable (arbitrary) number of string arguments (letters) and determines whether the letter is a vowel or consonant. Note: Variadic functions receive the arguments as a slice of the type i.e. in below case it is string. You can play with the above code here. These interview questions and answers are NOT intended to serve as a shortcut to intensive learning by self trying and assimilating the programming concepts of Go. Moreover, these questions are framed by me from my imagination while learning Go and not from any Go interview as such. The sole purpose of these questions are to tickle your grey cells to make you think quickly and decisively in the right direction when you face challenges of daily rigors of Go programming. Also, for some of us, the Q and A format works well as far as learning is concerned, may be because in comparison to a long paragraph, Q and A are specific in nature apart from being precise. Q# 1. Write a program that prints the numbers from 1 to 100. But for multiples of three print “Fizz” instead of the number and for the multiples of five print “Buzz”. For numbers which are multiples of both three and five print “FizzBuzz”. 2. How many Looping constructs are present in Go programming language? A# 2. Only one loop - for. Q# 3. What is the default value of type bool in Go? Q# 4. In case of Constants which type of expressions are evaluated at compile time and which are evaluated at run time? A# 4. As a rule Constants are evaluated (determined) at compile time and never at run time. Q# 5. Which one of the following is correct? Q# 6. Short variable declaration := can be used only inside a function. True or False? Q# 7. Short declaration := can be used for defining global variables. True or False? Q# 8. What's wrong with the following code? variables must be converted explicitly so that both the variables are of same type. Q# 9. How can you rectify the above code? A# 9. Replace line 11 with the following line. Q# 10. What's the output of following code? Q# 11. What's the output of following code? Q# 12. Refer code snippet Ref12A and Ref12B. They have the same output. True or False? Note: They have different outputs. Q# 13. What's the output of following code? is intelligent enough to compute the length at run time. copies instead of a reference. True or False? Q# 15. Slices are reference type - the variable are stored in the heap? True or False? Q# 16. What's the output of following code? Q# 17. Maps are value types. True or False? Note: Maps are Reference types. A# 18. Global variables are not recommended as they may get accessed by multiple go routines (threads) concurrently that can easily lead to an unexpected behavior causing arbitrary results. Q# 19. Which of the following is NOT a valid Go identifier? Imp. NOTE: In Go the names of variable, function, constant, struct etc must begin with an Unicode letter or an underscore. Q# 20. Is variable name iCount same as icount in Go programming? A# 20. No. Go is case sensitive. Q# 21. In idiomatic Go code package names are all in lower case. Do you agree? A#  21. Yes. A few OS may not be able to handle mixed case names of packages. Q# 22. renderHtml - is it an idiomatic Go variable name? A# 22. No. renderHTML is a better choice. Andrew Gerrand suggests: Acronyms should be all capitals, as in ServeHTTP and IDProcessor. Q# 23. In Go there's no concept of uninitialized variable. True or False? Q# 26. Is it True - Go compiler is bootstrapped - i.e. Go programming has been used to build Go compiler? A# 26. Yes. Go 1.4 was used to build Go 1.5. As of Go 1.4 the Go compiler was writtem in C language. Q# 27. What is the output of the following code snippet? Q# 28. What is the output of the following code snippet? Q# 29. What is the output of the following code snippet? Q# 30. Arrays are homogeneous (their elements have same type) whereas Structs are heterogeneous. Is this Statement True? Q# 31. Arrays & Structs are fixed size. In contrast Slices & Maps are dynamic data structures that grow as values are added. Is this Statement True? Go functions support multiple return values. This feature is used for implementing error handling. In case you want to ignore one (or a few) of the values then you've the option to use blank identifier _ . Run this code to understand the use of blank identifier. The same code is reproduced below for your reference. Read the comments to understand it. How can we use multiple return values for error handling? Let us see another example [RefCode# 3]. See import section - "errors"
errors.New is used to capture the given error message. By convention, errors are the last return value and have type error, a built-in interface. Did you like this? Please share your views. Like functions, methods facilitate code reuse and are declared using func keyword. A function with a receiver is a method. All methods are functions. But all functions might not be termed as methods. In the above example the method area() is defined on the struct named shape. This might give you an impression that you can define a method only on struct. This is not true. You can define a method on any type you've defined in your package. However, you cannot define a method on a type from another package (including built in types). Important: In the above code we have used (s shape) as a value type receiver. Why is it better to have Pointer Receivers in Methods? In Go, whenever we call a function that accepts an argument, the argument is copied to the function. Go passes everything by value. In the above example, the method named area() has value type shape as method receiver. There are two specific reasons why a pointer receiver is recommended over a value type receiver. 1. With every method call the value is getting copied. Let us assume the struct contains many fields with large data sets. What happens if you're trying to copy this large struct? This is inefficient and the detrimental to code performance. In contrast to the value type receiver, a pointer receiver is extremely lightweight (4 or 8 bytes) as only the pointer (a reference i.e. an address) is copied and not the entire value. 2. you must use a pointer in cases where a method can modify the value that its receiver points to. Why you must use pointer receiver? As a thumb rule, except for small structs and slices, always go for a pointer receiver, because it's great for performance. Did this help you? If yes, feel free to share it.